The first time you go to visit 40 Knots Winery there is a good possibility you won’t find it at all. That’s because you’ll either forget Anderton Road makes a turn out to Seal Bay and find yourself at the Powell River ferry terminal instead, or you’ll drive right past the gated entrance without even realizing the estate is there. Unless of course you happen to spot the new Opening Soon. Can You Taste It? sign. Such is the fate when you spend eight years quietly building a winery in a spot the rest of the industry says couldn’t possibly make good wine. And, wow, do Montgomery, Ponich and vineyard manager Matt Rodemakers have something to share. Let’s start with the 15 acres of grape vines with names like Pinot Noir, Pinot Gris, Chardonnay, Pinot Auxerrois, Siegerrebe and Schonburger (and the plan to have 18 acres in production soon); an onsite production facility (press, fermentation tanks, laboratory for testing, bottling and labeling); and a newly opened tasting room to sample the winery’s Chardonnay, Pinot Gris, Pinot Noir and Rosé wines. Then there’s the location—oceanside and within eyesight of the Strait of Georgia (and the Powell River ferry terminal) on Anderton Road in Comox. 40 Knots certainly looks like a vineyard should—and you would be forgiven if you thought you’d just been transported to the Burgundy region of France. However, if you’re lucky enough to get a view of the entire vineyard from the office balcony, you quickly realize how the sea wind and salt air combine to create a sense of place you won’t find anywhere else. Where else can you hear sea lions bark and watch eagles fly while sipping an outstanding Pinot Noir? Not in France, that’s fairly certain. Getting to the point of having something to share, however, has been quite the journey for Montgomery and his staff. “If you had come even two years ago, and seen what the property looked like then and now,” says Montgomery. “A couple of years after buying the property [in 1990] I thought about putting in a vineyard,” Montgomery adds. “And I got talked out of it.” Which makes sense, considering the entire property was covered in alder and needed clearing. It’s not like he could till the soil, order some vines and start growing. So, Montgomery built a barn and put cows in it instead, all the while turning the property into the kind of hobby farm he and his wife were looking for when they retired to the Island in search of a quieter life. The idea of vineyard stuck, though, and eventually Montgomery hired a consultant to help him turn his hobby farm into a winery. That was eight years ago. “I just had this dream, and it just came along again and here we are,” says Montgomery. That meant ordering vines from France, burying drain tiles in the gravel-rich soil that makes up the property to keep the vines from getting “wet feet,” and recruiting staff. The first to come onboard the new venture was winemaker Ponich four years ago, followed shortly thereafter by vineyard manager Rodemakers. Both were employed in the Okanagan wine industry when they met Montgomery, and both made the decision to leave established wineries for the new Island venture. “And not starting at five in the morning because it’s 40 degrees at noon—that’s great too!” adds Rodemakers. Why then would their co-workers in the Okanagan think they were crazy? After all, many people said the same thing about the Okanagan when the industry first started up there. Well, there were the facilities, or lack there of. Remember that barn that had the cows in it? It now houses all of the winery’s production facilities and administrative offices, but it wasn’t converted until Ponich’s first year with the winery. “When I first got here, it was a wood barn with a dirt floor,” says Ponich. The cattle stalls, Rodemakers adds, hadn’t even been dismantled. Many would tell you the Comox Valley is too far north to grow quality wine grapes. In fact, some of the more successful wineries in the area have eschewed grapes altogether for other fruits like apples, cherries, blueberries and blackberries—all plants that grow well in, and are suited to, our climate. And finally there is the newness of the industry in the Valley. 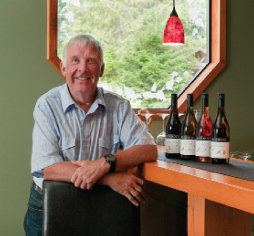 Most area wineries aren’t any older than five years, and the collective knowledge and experience about making wine in the Comox Valley is limited compared to other more established areas. “In theory it should work,” adds Rodemakers. “And heartbreaking,” says Montgomery. Last year’s summer-that-never-was meant the winery was only able to pick a third of the fruit they tried to grow. The rest was left to hang on the vine and rot, because it simply wasn’t of good enough quality to turn into wine. At 40 Knots winery, a large part of growing a quality grape and producing a great wine is getting to know the vines and the land they grow on. The French call it “terroir”— the special characteristics like soil, weather conditions, farming techniques, geography and geology that give a wine its unique qualities. Which brings us back to climate—the very thing that should be the vineyard’s biggest barrier to great wine. 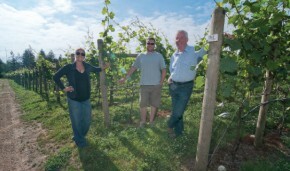 Early on, Montgomery noticed that the nearby ocean environment created a drier leaf canopy and a warmer microclimate than might be expected from a seaside winery. Records show the property is consistently two degrees higher than the airport, and that means—surprisingly—an ideal growing environment. Marine life and wildlife add a sense of enchantment to the property for both staff and visitors. The result has been some amazing wines, even in the first vintage. But what does it all mean for the “terroir” and the unique personality of the wine? “It’s meant to be drunk fresh with fresh foods,” says Rodemakers. This fits perfectly with the rich and diverse eco-system of the Comox Valley—a place that produces everything from seafood to vegetables, meats and grains in a compact geographical area. Which raises the question— with so much accomplished in such a short period of time, what’s next? However, the entire team does feel like they’re over the hump. They’re producing great wine, with the facilities to support larger scale production and marketing. Things are comfortable, and everyone is settling in to the task at hand— developing the full potential of a Comox Valley grape wine. “Now we get to start playing. We’re not just getting by. We can delve into the possibilities,” says Ponich.